Robert "Bob" William Hobbs, 84, of Hartford died Wednesday, April 13, 2011 at Royal C Johnson Veterans Hospital in Sioux Falls surrounded by family. Robert was born January 2, 1927 in Sioux Falls, SD and graduated from Hartford High School in 1944. 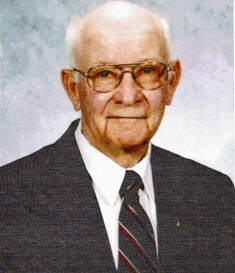 Following high school he served in the US Army during WWII and enjoyed farming for a large portion of his life. After farming he was employed at the Crooks elevator for some years. He was a lifetime member of the DAV and Hartford American Legion, which he was a member for 64 years. He enjoyed gardening, feeding the birds and squirrels, as well spending time with the grandchildren. On January 30, 1976, he was united in marriage with Marilyn Jane Pearson in Sioux Falls, SD. Follow the marriage the couple lived north of Ellis on the farm for many years and later moved into Hartford. Visitation will be at the Barnett-Lewis Funeral home in Sioux Falls from 6-8pm with the family on Sunday April 17th and the Memorial Service will be held at the Hartford United Methodist Church in Hartford, SD on Monday, April 18th at 10:00am. Grateful in sharing his life are his wife Marilyn of Hartford, his children David and Pam Skliris of Flandreau, SD, Jane and the late Dan York of Linn, KS, Kim and Jon Moore of Plankinton, SD, Toni and Raleigh West of Hartford, SD, and Deb Pearson of Vermillion, SD, 11 grandchildren and 1 great grandchildren who brought great joy to his life. His sisters Janice and Jack Rogers of Apache Junction, AZ and Phyllis and Leno Berg of Huntington Beach, CA. Robert was preceded in death by his parents William and Elsie Hobbs, Sister Ruth Bartlett, life time friend Ronald "Nick" Zigler, Son in-law Daniel York, his grandparents and many aunts and uncles. In lieu of flowers, donations may be directed to a Charity of your choice.